The world is your bar counter and can be moved to just about any location you wish to take it. It is called the Bar Globe and it houses your favorite drinks along with ample space for your glasses as well. 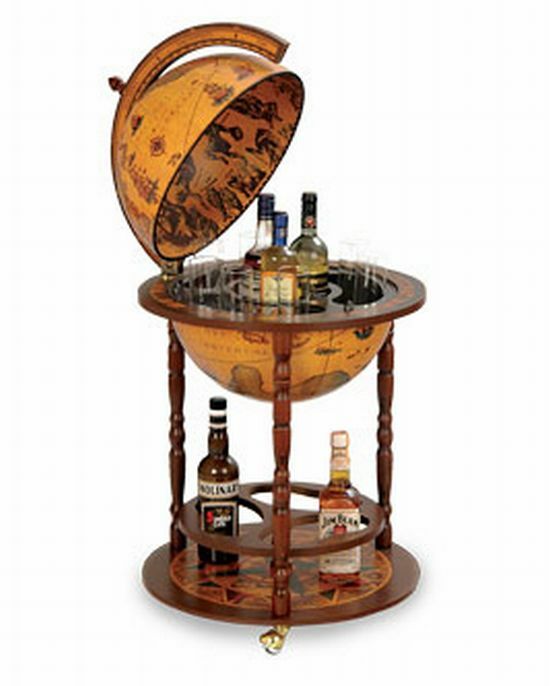 The Bar Globe is an elegantly designed bar counter shaped like the globe. The surface displays 16th Century nautical maps from the National Museum of Science in Florence. The old age looking maps lend a classic look to the product. This globe stands 38.5 inches high and has a diameter of 22 inches. It opens up at the equator to reveal a wonderful world lying within the exterior world. The interiors have hand painted frescos giving the domed ceiling a contraspecto effect. This means a ‘view from the heavens.’ With such an irresistible piece of creation on one’s side, the feeling of elation is sure to creep in. And why should you not be elated? After all it is a piece of art that is sure to leave every visitor spellbound. 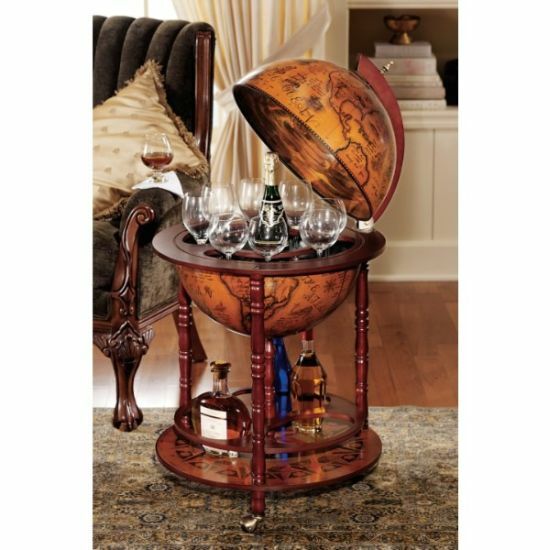 The Bar Globe has been crafted from Italian hardwood. A circular wooden frame acts as a support for the globe as well as for the glasses within. Both the frame and the globe are mounted on three hardwood legs originating from a circular base. The base gives extra storage space for your favorite drinks. In fact you will have to put it together when you get it from your vendor. That adds its own bit of thrill to owning this exquisite piece. It takes less than half an hour to put it together and presto, you have created your very own Bar Globe which will be the eye catcher of every visitor. Do not be surprised if you start getting great remarks from every visitor. Serving them from this globe will have a charm of its own. The entire ensemble has been made locomotive thanks to the wheels attached to the base. You might want to enjoy your drink out under the night sky or well within the confines of your room, take it where your mood takes you. The Bar Globe also serves as an excellent home décor product and can prove to be a great gift for your friends and family. It is priced at $300. Whether you are alone or with friends, the Globe will be there to give you company and give every moment a classic and warm touch. It is cheers all the way. While you are with your friends, you can also show them some magic by using Bartending Magician Tricks and if there is any need for wine make use of a Wine Bottle Opener.